First, the man. There can be few landscape photographers in the UK who haven’t heard of David Noton. He has emerged on the crest of the digital SLR revolution as one of the foremost digital landscape photographers in this country. He has served his time, facing the struggles of all aspiring landscape photographers trying to make a living from a hybrid photography business, doing a bit of this and a bit of that until his profile in landscapes allowed him to become a specialist. There can be no doubting that David is a hard working, dedicated man. Some may envy his lifestyle now jetting from country to country making images in spectacular locations before coming home and getting in his customized Land Rover Discovery (complete with roof mounted photography platform) to lead premium priced landscape workshops. For many of us, this is the life we aspire to. But this has come through grit and determination. It has not been an easy ride. A willingness to be up long before dawn, day after day, month after month chasing the right conditions that have become the hallmark of his images. He advocates getting ‘mud on the boots’. Getting out of the car and walking to track down the perfect spots. No driving around looking for locations from the car window for David. He is an evangelist for dedicated location searching. His rise in the business coincided with digital SLR’s becoming affordable and popular, reigniting a passion for photography for many who had somehow let it slip away while film reigned supreme. His ability to market himself along with his ‘blokey’ down to earth style has appealed to many. He is the kind of guy we can imagine going out on a shoot and enjoying a bacon sandwich with afterwards. A photographers photographer. That’s the man. Now the book, his second, called Full Frame, has been released to coincide with his new DVD, ‘Photography in the Raw’ (which we will be reviewing shortly in Great British Landscapes). The book is based around 10 chapters in which we get to follow David and his ever present wife, Wendy, as they journey around the World for twelve months in search of new vistas to capture. We get to see Morocco, Bali, South Africa, Laos, Provence, Umbria, Canada, Dorset, Snowdonia and finally Bolivia. Tough being a landscaper, isn’t it? The chapters are written in Davids well known chatty style and although some readers will be disappointed that a lot of content from his popular blog and newsletters is reproduced or repurposed here, it is usually expanded upon and the majority of the material has been written exclusively for the book (after all this is documenting his trips for the last three years, as were the despatches). As we have come to expect, David shares not only those thrilling adrenaline fueled spectacular moments of fabulous light we live for, but also the lows. Weeks shooting in Laos with skies laden with ash from farmers burning off fields of stubble making landscape images almost impossible. He describes the agony of traveling 16,000 to Bali and back and spending two weeks to get just one ‘killer’ image. As I said, David is a man who puts in the hours. But despite some trips not living up to expectations his optimistic approach and willingness to adapt and work with what he had led him to dig deep and turn to people and place image making. Throughout the book you will find David has spent more time photographing the people of the lands he has visited, their markets and workshops. It is not what he does best, but he has captured some great personalities working wide open with his 85mm f1.2 L lens. I defy anyone not to be moved by the image of a young girl in stunning morning light beside a river in Laos, that he calls ‘A Lao Mona Lisa’. Enigmatic and intriguing. His willingness to adapt, not to be defeated, is a lesson for all of us a landscapers to learn from. It is so easy to go home after another fruitless dawn shoot in a glum mood when , in reality, there probably were images to be made if we had only taken our focus off of the wide landscape and taken a positive look at what else there was to be had. The book is lavishly illustrated and a lot of thought has gone into the page design to give it a ‘travel diary’ feel. He is a master of wide landscapes and his use of the same digital cameras and lenses that the majority of landscape photographers now use gives us hope that we could achieve what he does, if we put in the effort. he makes these images seem within our grasp. It is not an instructional book, but you will find nuggets of helpful information and tips nestled in the text. You will see how David uses a infrared converted body to make some beautiful images in summer sun and his early forays into using extreme ND filters to lengthen his exposures. You will also find his wife, Wendy. She deserves a mention. Many landscape photographers would wish to have a wife like Wendy who is prepared to rise in the dark with them to trudge into remote locations for the dawn shoot. Regular followers of David will recognize her as she appears in yet another of his images as a lone figure (complete with one of her trademark wide brimmed hats) walking through the landscape, giving a sense of scale and perspective. On the downside, he does seem to worry quite a lot when she is let loose in yet another local market as she has a penchant for fabrics and other artifacts that just ‘have’ to be bought and taken home. Small price to pay, David, for a wife who is prepared to indulge you in your photography! So what we have is a beautiful coffee table book (or in Davids case, malt whiskey table book might be a better description - you will read of his beloved collection of Scottish single malts). 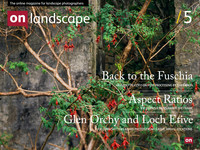 It makes a good read for all landscapers who revel, not only in the images, but also in the trials and tribulations, as well as the occasional victories, that we all experience when out with our cameras. Could the book be better? Yes. I would love to read more tips and techniques, perhaps going beyond the basics and maybe a bit less of how it feels to be experiencing disappointing light again, although David is able to derive the positives even from these shoots with his upbeat and positive approach. On my bookshelf it sits happily beside Davids first book and will be taken down and enjoyed from time to time as I sip a glass single malt and dream of wild places and the great people who live there. The book is available direct from Davids website. Editors Note: We should add that as well as getting more bang per buck, David also makes a better margin if you buy direct, as do any photographers. So, support all photographers by buying direct where possible. .